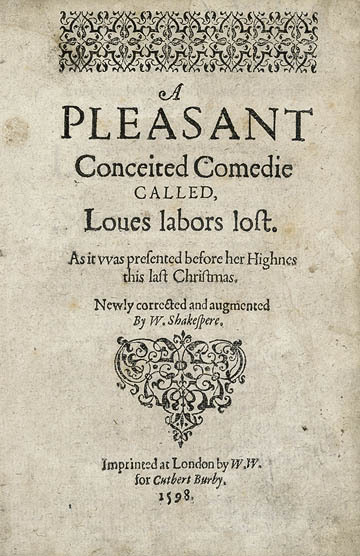 Apparently Shakespeare wrote a sequel to Love's Labour's Lost called, what else? Love's Labour's Won. No copies have ever been found. I'm glad. The lack of conclusion at the end of Love's Labour's Lost may be problematic for some, but for me, it seems to complement the theme of the play. Now, when I say the theme, what I mean to say is, the theme I took away. After one reading. One, admittedly, rather distracted reading. (Clearly I'm lacking in confidence here.) The theme? There are some things that science and intellect cannot approach. Love, for example. Likewise, there's seems to be a minor but complementary theme that words can sometimes get in the way of meaning. If such a case could be made, both would be interesting themes for Shakespeare. When his characters normally tend to fall in love at the drop of a hat, critics could easily accuse Shakespeare of confusing love for infatuation. Of course, if the Eskimos* have 100 words for snow, surely there must be at least twice that many for love, and on that list, surely there's a place for infatuation. Which leads into the 2nd theme about words and meaning. Are we getting more accurate by breaking love down into sub-categories (infatuation, lust, romance, platonic...) or do we risk missing the entire point? It would seem that Shakespeare is writing his own defense. The ironic thing about it is that the defense hardly holds up in modern times, when reading Shakespeare is considered an intellectual pursuit and he's generally regarded as the ultimate wordsmith. (Don't worry, this all makes sense in my head.) In any case, as it's my belief that Shakespeare is making a statement about the mind approaching, but never quite reaching the heart— some sort of philosophical asymptote— a cliffhanger ending is brilliant.